Last weekend we went to the mainland for a family picnic. You may remember a dinner in May where we celebrated my parents' 60th wedding anniversary. This was a larger event, some 35 of us gathered at my nephew's. The biggest draw, for most of the second cousins, was the trampoline. The saddest faces occurred when it was time to give someone else a turn. 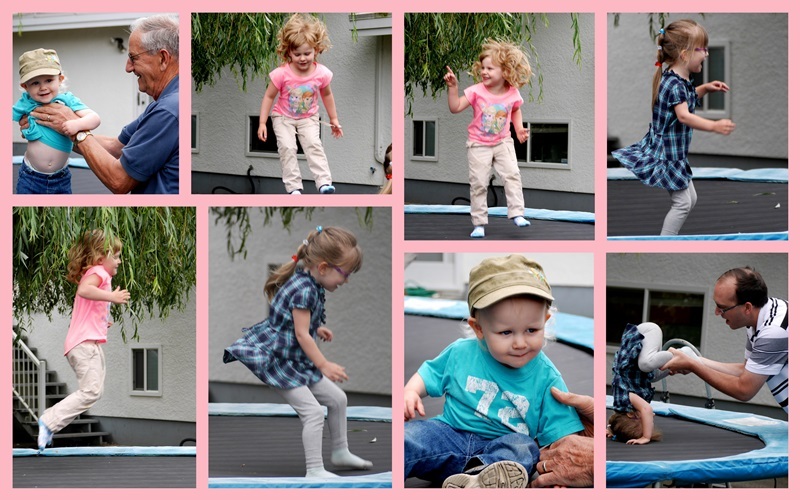 I've only included our grandchildren in these photos, but others enjoyed the bouncing, too. Oh, the energy. And it struck me how long and lanky those girls are getting at 4.5 and 3. Our back fence neighbour and I often chat over our respective compost bins and gardens. Last summer I admired his gorgeous poppies and he generously gave me an envelope of seeds to plant. I need to ask his advice because while this flower is gorgeous, the plant isn't nearly as tall as his. And only one plant flowered. Such deep, rich colour in this lace cap hydrangea. Such intricacy of design. There were blackberry bushes with a few berries at the picnic. One Little Miss collected them in a bucket and handed them out as "blackberry jam." I'll be taking a blogging break for a couple of weeks. Summer is here and I'm planning to enjoy some relaxation. Come September I'll be teaching regularly. I've accepted a 57% teaching position - just afternoons. Two English 9s and one French 8. The English continues through the entire year and come second term I'll switch to Home Ec 8 in place of French. I'm so thrilled with this position. August is a time for a break. Enjoy your rest and relaxation, Lorrie. How cute the girls are in your photos! I've never seen a hydrangea like that....exquisite! Congratulations on your new position. It sounds perfect for you! We have a tramponine/kid magnet too - so much fun and your poppy looks nice, hopefully more next year? Have a nice break Lorrie and enjoy your Summer - maybe I'll see you out on the water. Congratulations on your new teaching position. Pretty flowers and fun shots from your family gathering. Enjoy your break from blogland. You will be missed. Oh my! I thought the same thing seeing your grandgirlies...getting so long-legged and growing up fast. Yay for the teaching job! Sounds like good hours! Sounds like some great courses to teach next school year. Enjoy your break. The teaching job sounds nice, enjoy the rest of your summer! There's nothing quite as fun as a trampoline for the kiddos! Beautiful blooms and berries! Adorable grandchildren! Congratulations on the new position! Now that sounds like just the right kind of job position. The poppy is beautiful. I am guessing next year it will multiply and settle in to it's beauty. Did the littlest jump on the trampoline? My grandson had the opportunity recently, but it scared him. Your grands are so darling! They grow so fast! Glad you all had a big family gathering, that is special! Your flowers are beautiful, too! And congratulations on your teaching position! Afternoons sound great! With the zip line being a great attraction at camp this year, I was telling the person who was doing my safety buckles that the trampoline was the big thing when I went to camp.Glad to know it still is fun.That teaching job sounds perfect for you! I'm wondering if you speak Spanish as well. Three languages? Congratulations on your teaching position. Sounds wonderful. Enjoy your break, too. I love when a celebration lingers. Why not make the most of a happy milestone? Congratulations on your new teaching position! It sounds like the best of both worlds, off mornings and working afternoons. Enjoy your break...soak up summer!! Oh Lorrie, congrats on the new job, that's going to be fun for you. And taking the summer off is a wonderful idea...many bloggers are doing that right now...I'm only posting on Fridays in order to get out more and take more photos. Have a wonderful and lovely rest of the summer. That trampoline looks like so much fun, and thoe flowers are exquisite! Enjoy your blog break and congratulatiosn on your new job! I'm happy for you on your new position come September! Enjoy your summer...and your 'time off'! I bet you are looking forward to September! Best of luck with the teaching position, I'm sure it will be challenging and rewarding at the same time. Wonderful photos. Loved the little fingers reaching to take the berry. And your new fall schedule sounds delightful... part-time teaching of what sounds like great courses. I'm pleased for you!